Start with Why, – if we Start with Why, people join us who believe what we believe. How to Create a Wave of Change – by actively engaging everyone in service of our Why, we can release a wave of human potential. 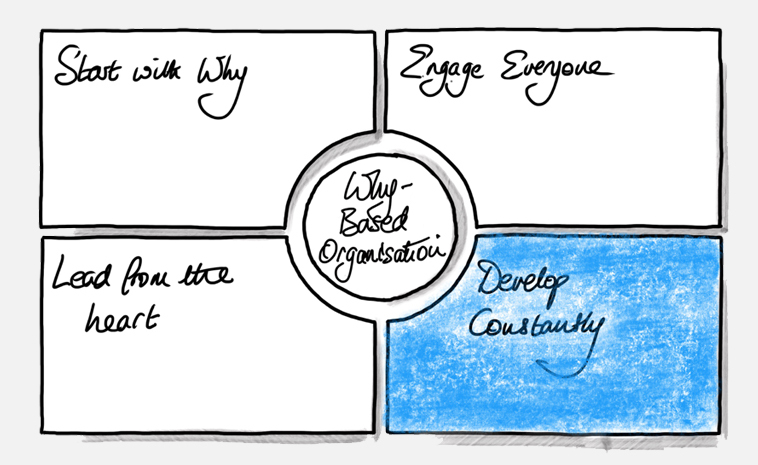 Organisations that practice these four foundational pillars stand out over other organisations. Why-Based Organisations are special places, where trust, loyalty, collaboration, and integrity are the norm – and high performance is the outcome. Why is Constantly Developing (the fourth pillar) so important? In this world of increasing change, it is essential that organisations are able to meet the challenges of changing markets, economic environments, and customer needs and expectations. Businesses that can do this are much more sustainable over the long term and, as a result, are able to plan and execute their investments over a longer time period, creating greater certainty and structure for their people. To be able to do this, they have honed their ability to learn from everything they do, be adaptable in their thinking and approach, and therefore become resilient. All of these attributes have been greatly discussed and there are many good books on each. However, it basically all boils down to this: thriving organisations have the ability to adapt to changing situations. When these attributes are not in place, there is great danger, as businesses become fixated on ‘what’ they do. When the world inevitably changes, so do their fortunes. Take for example the story of the Swiss watch industry, an industry that had dominated quality timepieces. These timepieces had the reputation of being the most accurate in the world; if you wanted a quality watch, you bought a mechanical Swiss movement. There was nothing that kept time better. Better, that is, until quartz technology was made available for wristwatches in the late ‘60s and early ‘70s. To cut a long story short, because the Swiss watch industry seemed to be fixated by What they did (making mechanical timepieces), it largely ignored this new technology, even when directly offered it. The Japanese and Americans took up this new technology and, between 1970 and 1988, Swiss watch employment fell from 90,000 to 28,000. It took over a decade of pain before this now significantly smaller Swiss watch industry started to embrace the new technology (in the shape of Swatch) and started to build back its world leading reputation. Arguably, had the Swiss watch industry been sourced from their Why (to be at the leading edge of timekeeping and to constantly develop time keeping accuracy), rather than sourced from What they did (make exceptional mechanical timepieces), there might have been a different outcome with much less pain. So what do you need to have in place to be able to Develop Constantly and not be fixated on What it is you do? Well, in addition to many of the staples that ordinary organisations have in place, such as a clear strategy, a sound business model, great people, and efficient processes, we have noticed thriving organisations have five other attributes that enable them to Develop Constantly. Looking outside as well as inside – Organisations that are constantly developing are always looking outside for new ideas, trends, and what they can learn from others. It is only when they have done this can they look internally at how they are currently organised. The question they then ask themselves is: ‘Are we organised in the best way to deliver our Vision and fulfil on our Why?’ If there are areas where this is not the case, then action is taken. Note: this is completely different from simply looking internally and improving your internal process – no doubt that however efficient Swiss watchmakers in the 1980s were, it would have made little difference to their fortunes. Operating with no fear – It is well known that humans cannot be creative or innovative, or indeed productive, if we are in a state of fear. Biologically and mentally, when fear kicks in, our bodies shut down non-essential functions and focus on survival – when in a work environment, we simply ‘keep our heads down.’ Organisations that Develop Constantly know this and create a safe environment where people feel secure, valued, and cared for, resulting in people being willing to admit when they don’t know something, try new things, and take risks. Failure is both encouraged and accepted, and is used as a precious source of learning. Embracing the Power of Relationships – Organisations that Develop Constantly understand the power of relationships. They understand the power of building trust, of relating to people for their full contribution, and building the sort of relationships that you would experience in a family – one of caring for and looking after every person in the team. As Bob Chapman says in Everybody Matters, “The more we combine work and caring, the more fulfilled we will be and the further we will collectively advance.” Inside Why-Based Organisations, honest feedback and coaching is sought and given, inside the mutual desire for everyone to improve. The Balance of Challenge and Support – These organisations have a healthy balance of challenge and support. Performance is expected and sought, and people take on challenging goals knowing they have a supportive environment and working in this way is going to be exciting, stretching, and fun! Viktor E Frankl said, “Fear brings about that which one is afraid of.” Leaders of Why-Based Organisations know how to create safe environments for their people, releasing their full potential and enabling them to do their life’s work. When we all feel safe and connected to what’s important to us, we thrive. When we all thrive, our organisations thrive, being both high performing and adaptable. WhyNot Partnering (www.whynotpartnering.com), is an organisation dedicated to transforming the nature of work, by creating Why-Based Organisations, where trust, loyalty, collaboration, and integrity are the norm – and high performance the outcome. To stay connected with us and to hear more about our work, follow us on LinkedIn. Thank you so much for these though-provoking postings. It’s refreshing! In my experience, focusing on the Why allows me to be adaptive to external circumstances and dance with the occurring. Thank you for your feedback, Synthia. Please do stay connected and we will have a new video series coming out with Simon on Thriving Organizations shortly. Great to hear from you and you are spot on! When we have our Why as the ‘North Star’, everything else becomes easy, and we are able to adapt to current circumstances and ‘do the right thing’ (in any situation). It is such a simple yet profound idea…let’s hope it really catches on! I just want to say I’m very new to weblog and honestly loved you’re web site. Very likely I’m going to bookmark your site . You really come with outstanding stories. With thanks for sharing your web site. You could definitely see your enthusiasm within the work you write. The sector hopes for more passionate writers like you who aren’t afraid to say how they believe. Always follow your heart. I would like to point out my respect for your kindness supporting men and women who absolutely need assistance with this important question. Your personal commitment to passing the message up and down had become astonishingly important and has really helped women just like me to get to their endeavors. Your valuable publication implies a great deal a person like me and still more to my office workers. Warm regards; from all of us. I needed to draft you the very little observation to finally thank you yet again for your striking thoughts you’ve shared in this case. It’s really unbelievably generous of you to convey freely precisely what a few people would have offered for sale for an e book to help with making some profit for themselves, certainly given that you might have done it in the event you wanted. The secrets in addition acted as a good way to be certain that many people have a similar dream the same as my personal own to grasp lots more when considering this issue. I am sure there are thousands of more enjoyable times up front for people who read through your blog post.